In every town there’s a kid who thinks of nothing other than one day driving his very own dream truck. It takes over everything during those impressionable early years, from begging parents for truck toys to doodling sketches on every piece of blank paper that comes our way. Once this motor mania settles in, the flame tends to stay ignited for the long haul. 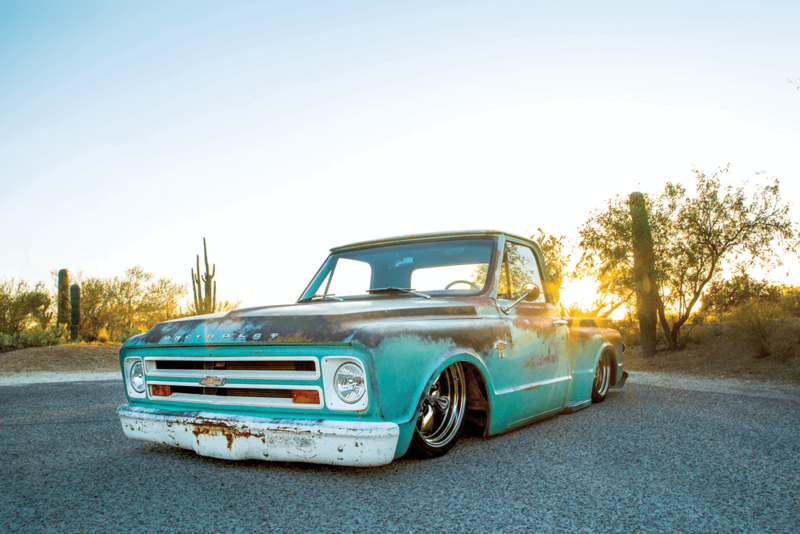 The owner of this humble, patina-clad C-10, Tim Parish, can certainly attest to that fact. Tim’s pops is an old-school hot-rodder, a real car guy through and through. 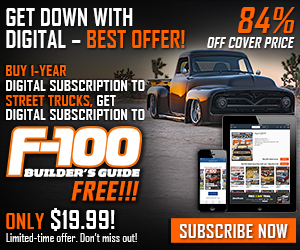 He gave Tim a firsthand look at just how cool custom cars of any make or model can be. “I always think back to when our family went out to car shows,” Tim remembers. “Back in the day, cruising the main streets of town was a common occurrence for us on Friday and Saturday nights.” Tim had no other option than to sit back and go along for the ride back then, and now he wouldn’t have it any other way. Tim’s old man must’ve known his son was enjoying the experience, but he probably didn’t have a clue how much of a lasting impact those slow drives through town were making. 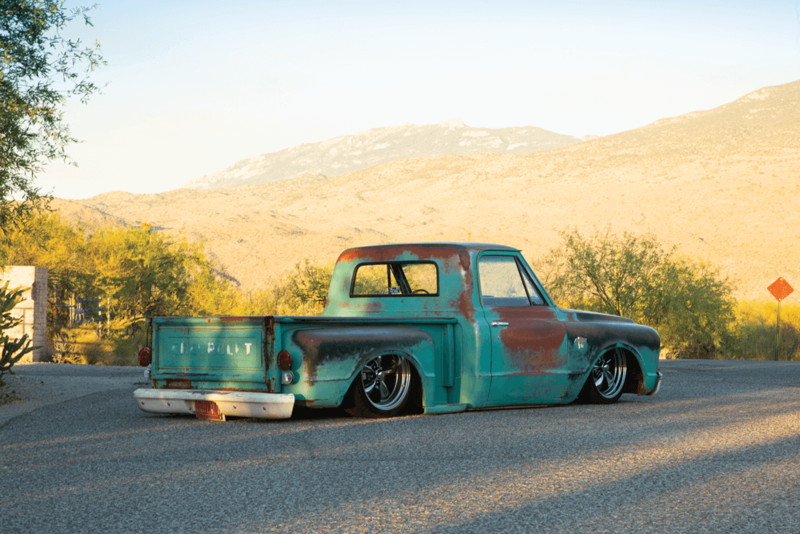 The progression spanned 15 years to when Tim purchased the ’67 C-10 step-side seen here back in 2008. 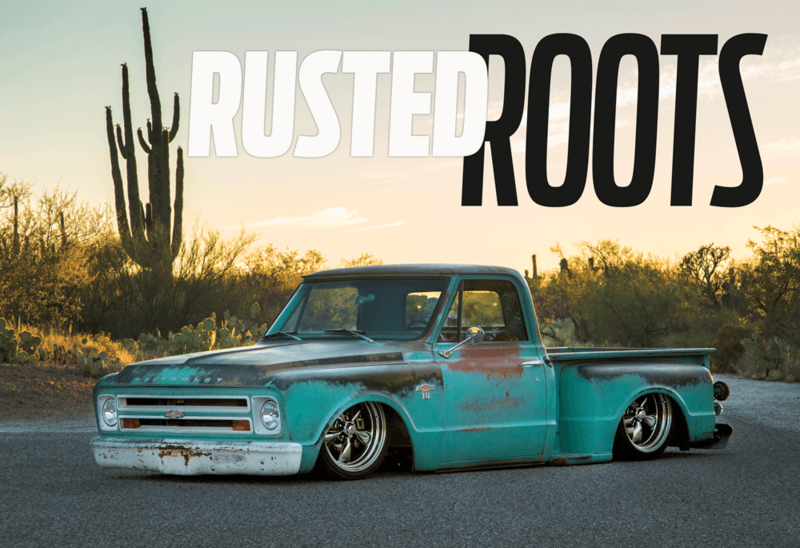 “The truck was a stock daily driver for a long while,” Tim says of his years of ownership. “Due to several OEF [Operation Enduring Freedom] deployments and other future military commitments, I decided to have the truck taken up a notch or two in 2017.” Selecting the right hands to help him get the job done was rather easy since there are more than a few highly qualified C-10 experts in Arizona, with one being Jeremy Rice of Tre 5 Customs. Tim didn’t simply pick Tre 5’s name from a hat, though. He had heard and seen more than enough fine examples of completed classic Chevy pickups with Jeremy’s name attached. Tim planned to do some of the work himself, for which he recruited friend Roy Mann to assist. 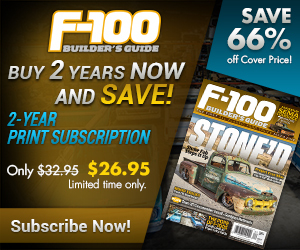 He also had Roy help him transport the truck to and from Tre 5 throughout the build phase. Tim’s latest truck project was officially underway. 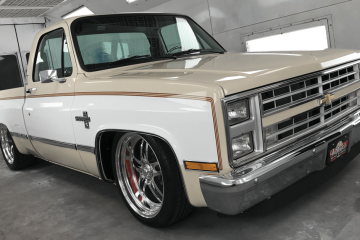 THE PORTERBUILT UPPER AND LOWER CONTROL ARMS AND CPP SPINDLES ARE JUST A FEW OF THE HIGHLIGHTS OF THIS C-10’S STUNNING SUSPENSION SYSTEM. While the guys were busy stockpiling parts for the ’96 BBC, Tim lined up Bob Metz to rebuild the transmission once the time was right. The project was certainly a group effort and was soon headed in the direction Tim had always dreamed. Jeremy knew that Tim was hoping to get the truck wrapped up before his next extended military tour, and he was already well into having the suspension system buttoned up, complete with Porterbuilt front and rear Dropmember kits. Full CPP big brake kits were installed on both ends for monster stopping power and a little extra eye candy because they poke through from behind the spokes of 20-inch American Racing Torque Thrust II wheels. Once Tre 5 was finished with the chassis work and additional body modifications, in the form of custom panels to shave the firewall, a raised bed floor, wider wheel tubs and the installation and slight alteration of the MAR-K bed wood kit, the truck was off to Steve Yiu of Elevated Designs for a complete interior overhaul. 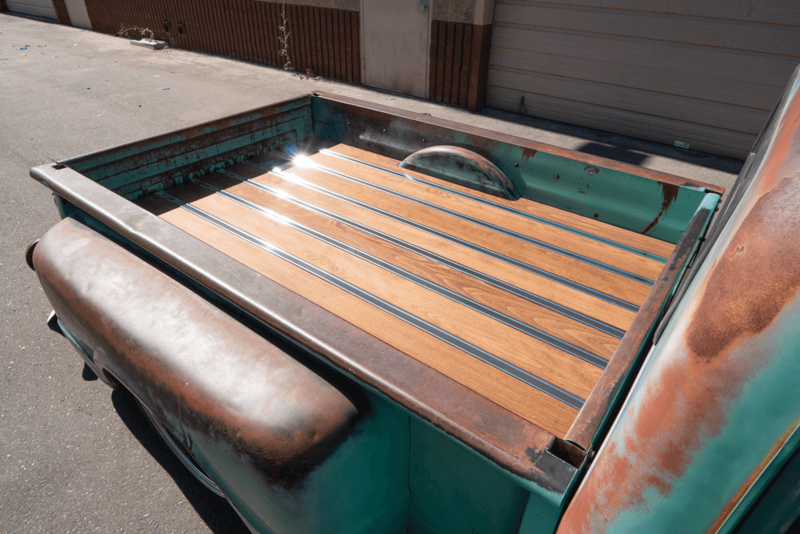 THE BED HAS BEEN OUTFITTED WITH A NEW WOOD KIT FROM MAR-K AND WAS CUSTOMSTAINED BY TRE 5 CUSTOMS IN A SHADE THAT COMPLEMENTS THE TRUCK’S NATURALLY FADED PAINT AND PATINA. 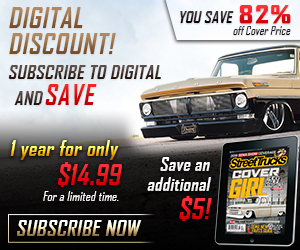 Nothing too over-the-top was slated for the C-10’s cabin, but the few modifications made to it did make a world of difference. Steve reupholstered the factory bench after fitting new seat foam. He also fixed the cracks in the dash pad and wrapped it in matching material. 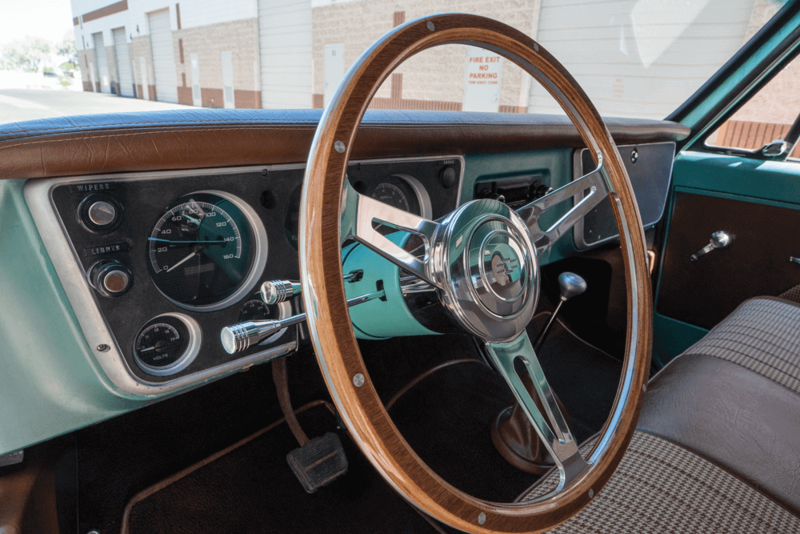 Other custom touches to the interior include new door panels and kick panels that Steve built and upholstered to match. He also laid down brand-new carpet. 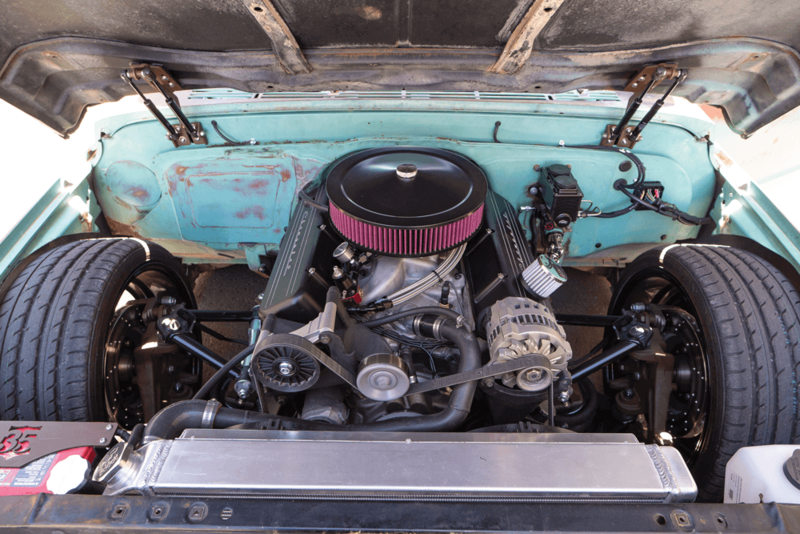 A simple stereo system was also added, including a Retrosound head unit, Powerbass 6-inch speakers in the kick panels and two 10-inch shallow-mount subs in a custom enclosure located behind the bench seat. The Powerbass five-channel amplifier that powers the stereo system is also located behind the seat. Underneath all of the new interior is several square feet of Vibro Solutions sound-deadening material. The whole rat look is cool and all, but there is a difference when it’s pulled off with some elegance. 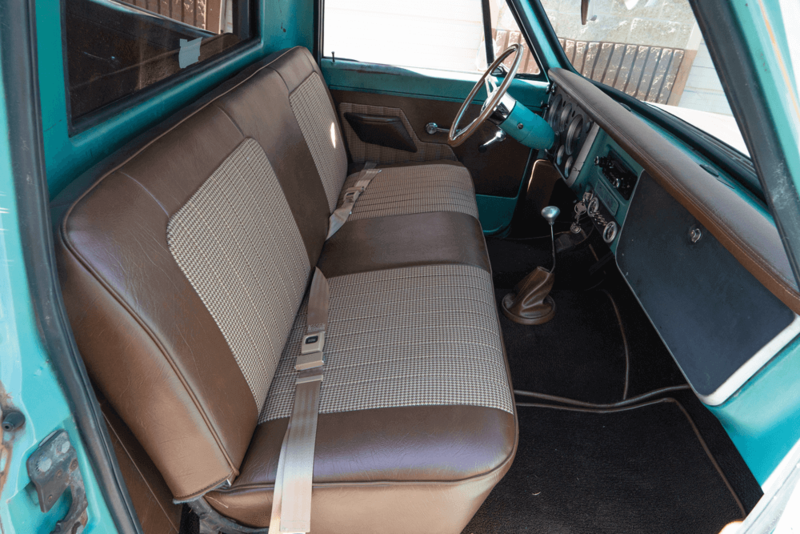 ELEVATED DESIGNS REWRAPPED THE FACTORY BENCH SEAT, AS WELL AS THE DASH PAD, FOR A WARMER, WELCOMING APPEARANCE. 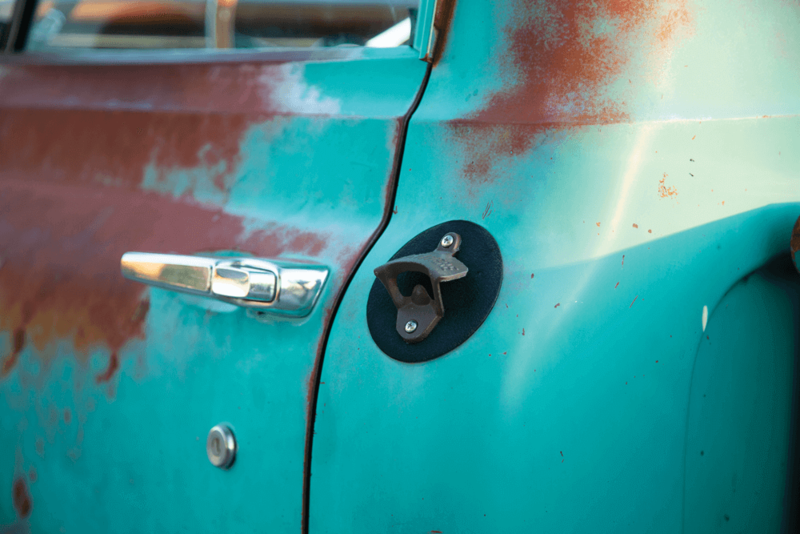 Speaking of the “rough around the edges” aesthetic, Tim chose to stick with the truck’s natural faded paint and patina on the exterior, which was a wise choice, in our opinion. The aging of the factory sea foam color is excellent; he had no intention of covering it in fresh layers of paint that he might tire of in the near future. Tim and Jeremy came up with some cool touches to personalize the truck even further. Jeremy mixed up a concoction from different spray paints to match the patina in several spots. The addition of wheel tubs in the bed and new sheet metal panels under the hood wouldn’t look right if they were left raw. So, after some experimenting, several coats of spray paint and sanding, a fauxtina match was applied. THE 1996 454-CI CHEVY BIG-BLOCK WAS A SOLID DROP-IN ENGINE SELECTION, UPDATED WITH A WHOLE BUNCH OF KILLER ACCESSORIES. Jeremy also picked up a new rear bumper from Brothers Truck Parts and applied a similar process to the bumper to age it and make it fit in with the rest of the truck. Tim’s final idea was to mount a bottle opener where the fuel filler once resided. Jeremy jumped on the idea and fit a rustic opener that looks like it’s been there for years. It’s these small personal touches that make this truck a true reflection of its owner’s tastes. WITH A BOTTLE OPENER BOLTED RIGHT ONTO THE CHEVY’S EXTERIOR, IT’S ALWAYS MILLER TIME. THE SUMMIT RACING STEERING WHEEL MAKES A NICE ADDITION INSIDE THE CAB. Tim comes from a family bred on cruising. He developed an affection for low-rollers early in life and hasn’t been able to shake it. He probably never will, mind you, and surely his eyes will be glued to his C-10 for years to come. Lucky for him every season is cruising season in Arizona.